The insides of my kitchen cupboards are starting to look like a game of Tetris. With every recipe calling for a different type of wok, casserole dish or loaf tin (?) things have started to get out of hand! The time to figure out some wall-based storage is long overdue, but living in a rental on a low budget means we need to think creatively. Here are a handful of ideas I found this week which might help if you're in a similar predicament. This is such a nice alternative to your typical hanging pan rack. I'm sure you could find a long, reasonably straight branch in your local park, then strip the bark off to make it smooth. Then all you need is something to support it (in this case, the brackets of the shelf) and some S hooks to hang pans and other equipment from. Bonus points if you can find a way to hang some nice plants and decorations, too. This wire rack idea from A Beautiful Mess comes with a full tutorial! It's a bit full-on for casual DIY-ers like me, involving cutting off wire with a saw (! ), but it wouldn't be too hard to improvise something similar. 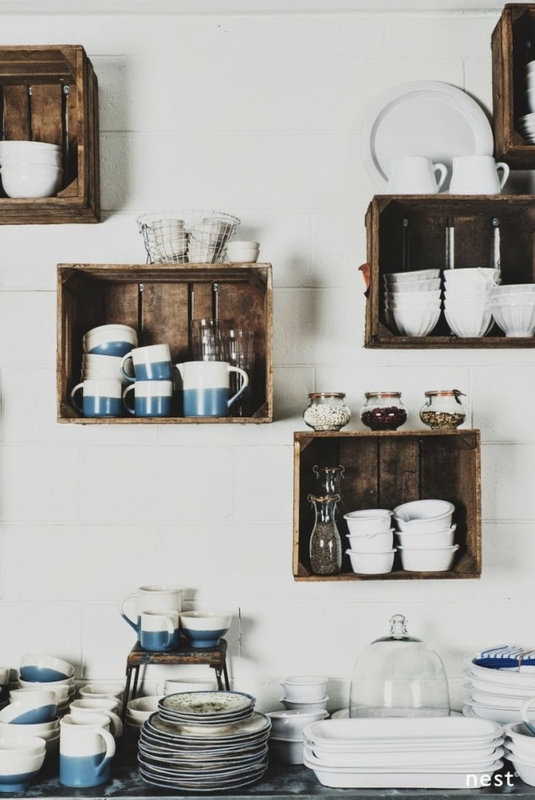 Crates on the wall are always a great idea. If it were me, I would have strung some fairy lights between them to join them up a bit. Without anything to link them together they might look a bit spread out. Images courtesy of L. de Miranda, A Beautiful Mess, Sfgirlbybay, Nest Direct.